This is the best burger I’ve ever had in London. I would say it’s the best burger full stop, but I’m too sentimental about In&Out burgers in San Diego to give that title away. But seriously, this is one of the juiciest and most perfectly balanced burgers I’ve ever come across. 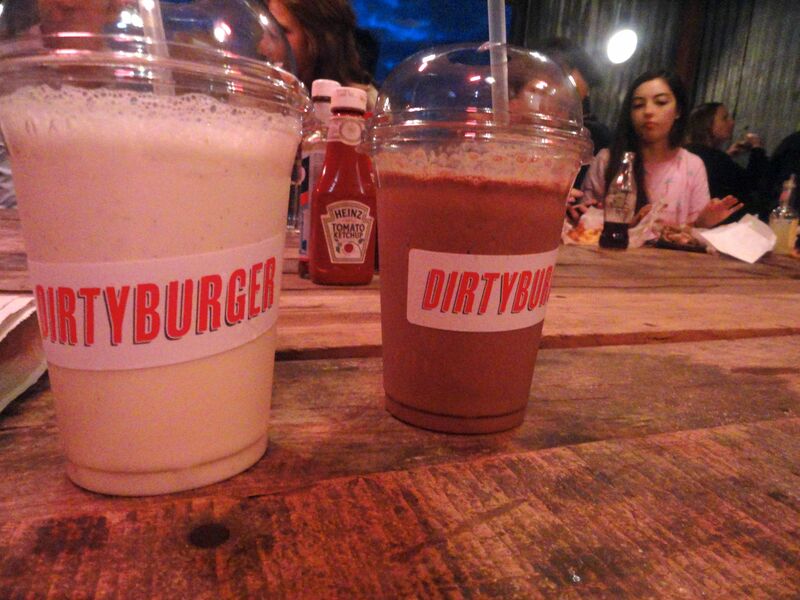 It comes from Dirty Burger, which is a newly opened burger shack at a backyard in Kentish town. The area is a bit unwelcoming, but for the amazing burgers, this is absolutely worth the detour. There’s only three things on the menu: cheeseburger, fries and onion rings. We ordered all three. 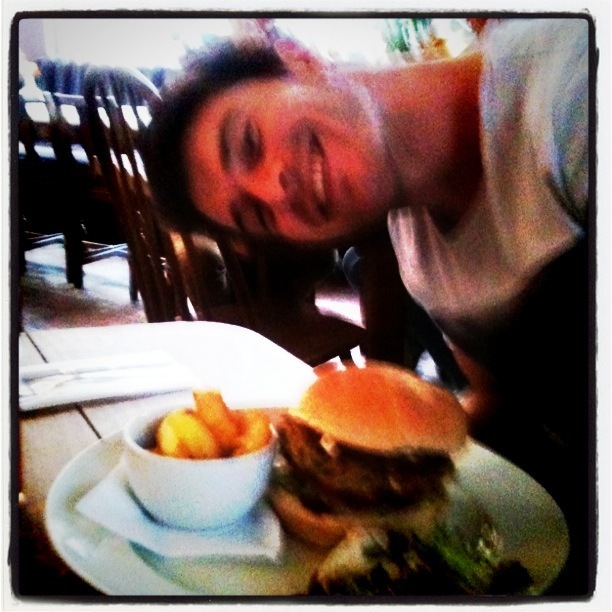 The burger was made up of a perfect patty – perfectly sealed, made of finely ground mince and hot but rare in the middle. The meat was tasty, juicy and very well spiced – and dare I say it, one notch better than Meatmarket! 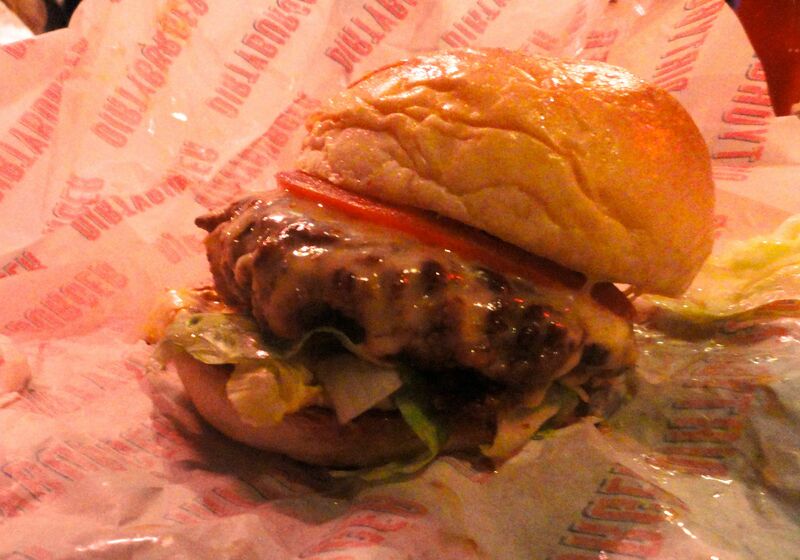 The cheese was strong, and added a savouriness to the whole thing which I find is unusual for cheeseburgers unless you go for a black & blue variant. It was topped with a creamy dressing, lettuce, thinly sliced tomato and pickle. And then there was the bun, which I read (madly enough) held a 15% fat content. It was glazed, and when you bit into it it oozed a little. In all it’s unhealthiness this is simply sublime, and a bargain bite, given how gourmet it is, at £5.50. The chips were nice, double fried and crinkle cut which made them very crispy on the outside but nice and soft within. The only drawback were the onion rings. Both me and Mr Meatball could have done without them: they just tasted of batter and weren’t salty enough. Thus I must disagree thoroughly with Timeout’s raving about them. 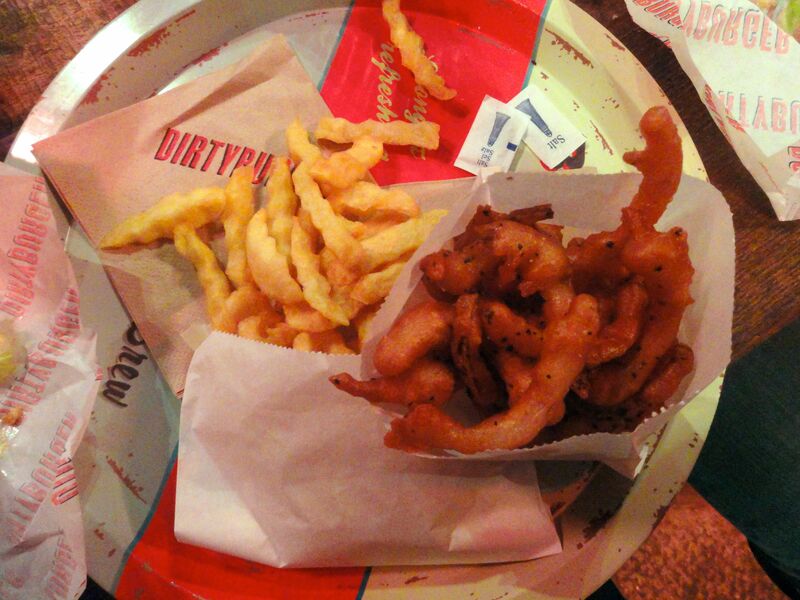 But perhaps it’s me who has a problem with onion rings, I always find there’s too much batter and not enough salt. The lovely staff gave us two free milkshakes as they messed up our order, and the vanilla Milkshake was loose and sweet, which I like. Not stodgy and frozen like McDonald’s. 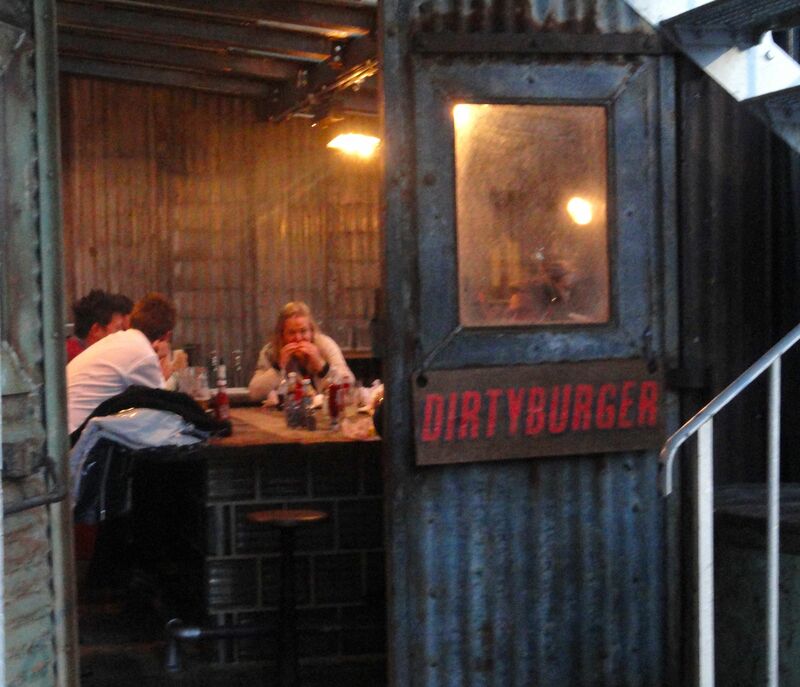 Dirty Burger has a cute shack eating area, but sadly it doesn’t have the same people-watching view as Meatmarket. The sides aren’t quite as brilliant either. However, given the affordable price and the insanely nice cheeseburger, it is awarded 8.5 meatballs out of ten. 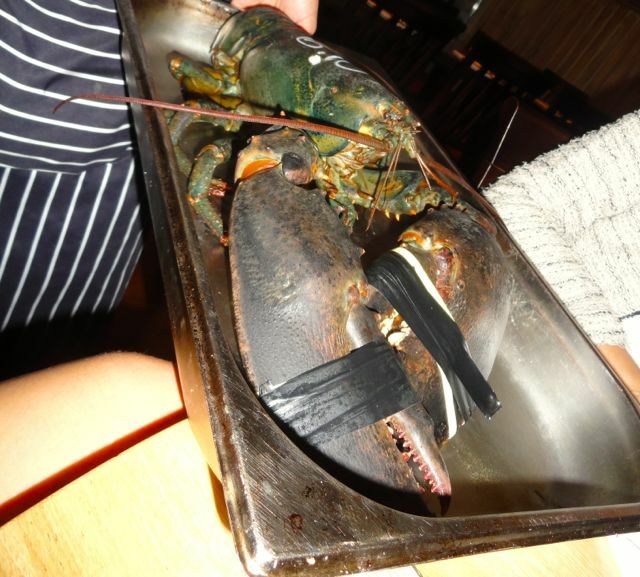 To me, lobster always sounded like lots of fuss for little, and expensive, food. 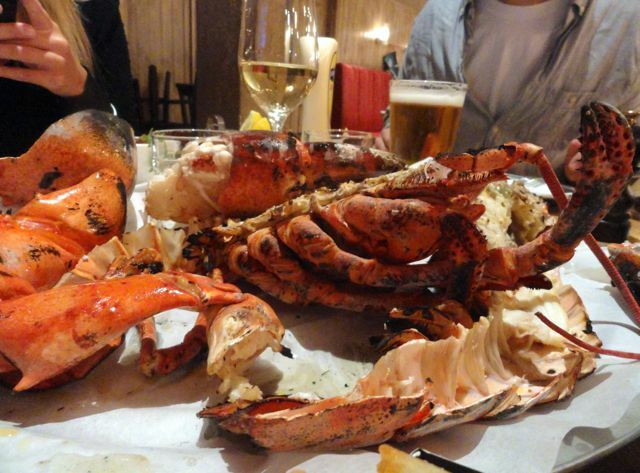 I have no problems with seafood that makes you work for your nibbles: anyone who’s attended a Swedish crayfish party knows the joy of devouring small red sea creatures for a small fingers’ worth of white meat. But since crayfish is cheap and lobster isn’t, I out of hand dismissed lobster. Now I must change that tune, having celebrated the end of university (forever!) 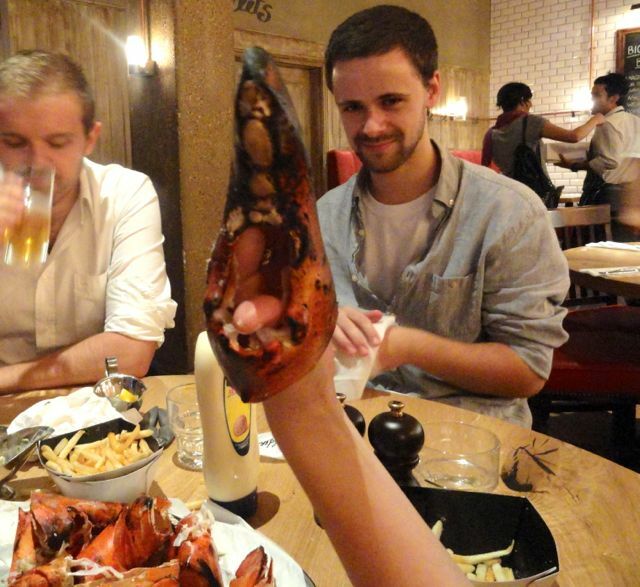 together with Miss Salted Cod and some friends at Soho’s newly opened Burger & Lobster. Because it was ridiculously nice. And while it wasn’t cheap, it wasn’t really expensive either. We arrived to our reserved table for four in the afternoon and the queues and stress I’d been warned about were nowhere to be found. After ordering in a round of Asahi we were offered to choose between a lobster, a lobster roll, or a burger. All would be 20 pounds each. The waitress also suggested a fourth option which we ended up going for: sharing a ten pound lobster between us, with unlimited fries and salad. 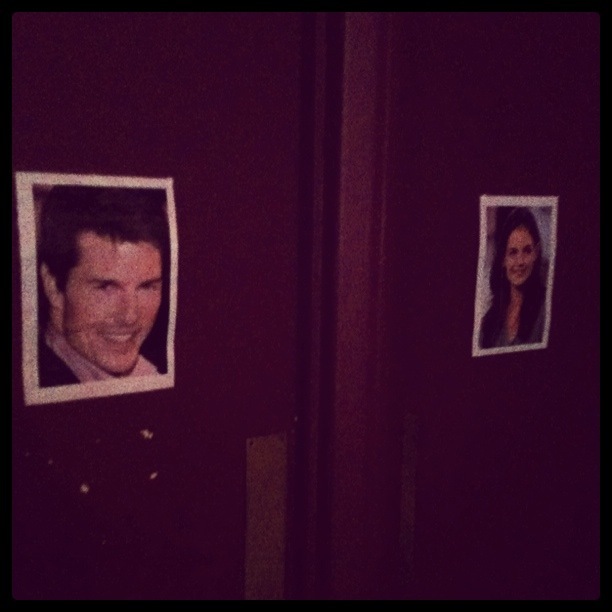 She even brought him out on a tray whilst he was still alive, saying she’d named him Brett. As Brett was steamed and grilled off to perfection (we were told he died by a swift cut through the head) we were kitted out with bibs, little lobster-tools and more Asahi. Once cooked and prepared for us, Brett was so large he had to come in on two different trays. 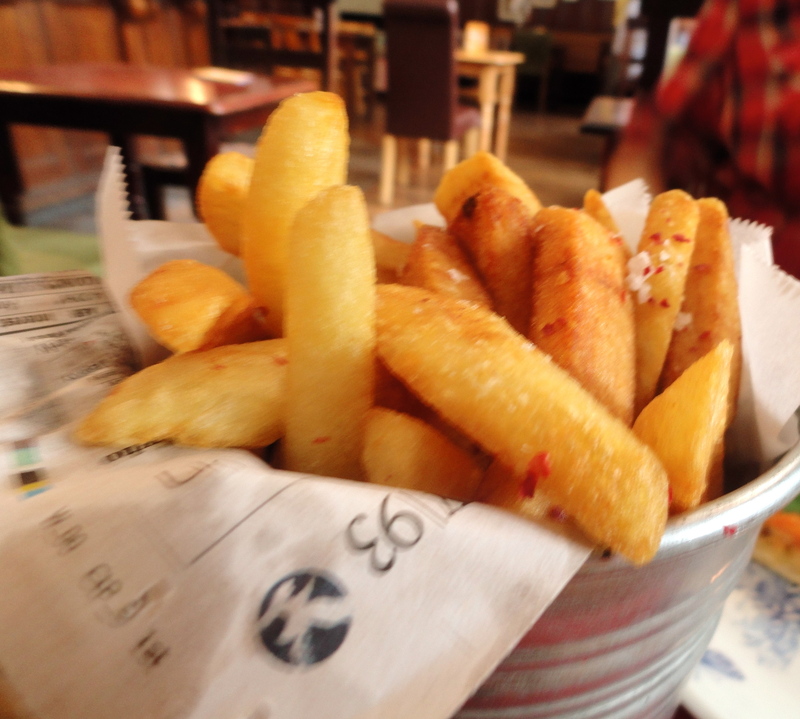 He arrived together with bowls of shoestring fries, salad and garlic and parsley butter sauce. The sauce was simply divine dripped onto tender lobster meat, and as we fought away over the best claw meat we almost forgot about the fries and salad, although these were also very nice. A few more rounds of Asahi and lobster picking was loads of fun, and it turns out eating a massive lobster is a nice group activity if nothing else. As we started using Brett’s claws as gloves (see Kristine’s hand above) we decided it was time to move on to a boozier establishment. But as for the quality of the lobster, the price and the overall experience, burger and lobster get a unanimous nine meatballs out of ten from both me and Miss Salted cod. Settling into my new home in “Highbury approach” (aka Holloway road…), I’ve already found a little gem worth some extra attention: The Acoustic cafe, serving up Mediterranean (mainly Turkish) cuisine with some bits of British tucked in. Whilst not unknown to locals, its humble outside doesn’t draw as much attention from North London c-list celebs as The Blue Legume does. However, dare I say it, the breakfast here is more fusionesque and adventurous, and actually better (and being a longtime fan of the mediterranean breakfast at the Blue Legume, that’s a harsh statement coming from me). 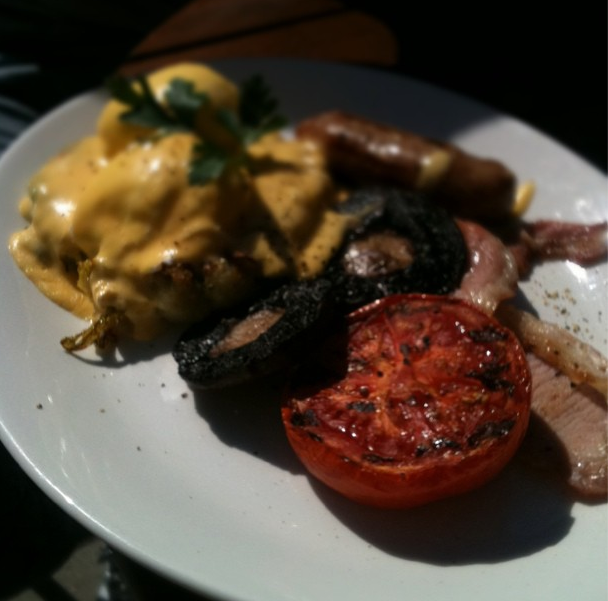 On the day we went, Mr Meatball had the Bubble breakfast treat, which was a rather British plate with grilled tomato, fried field mushrooms, bacon and sausage as well as a little hill of potato bubble and poached eggs with hollandaise sauce on top. 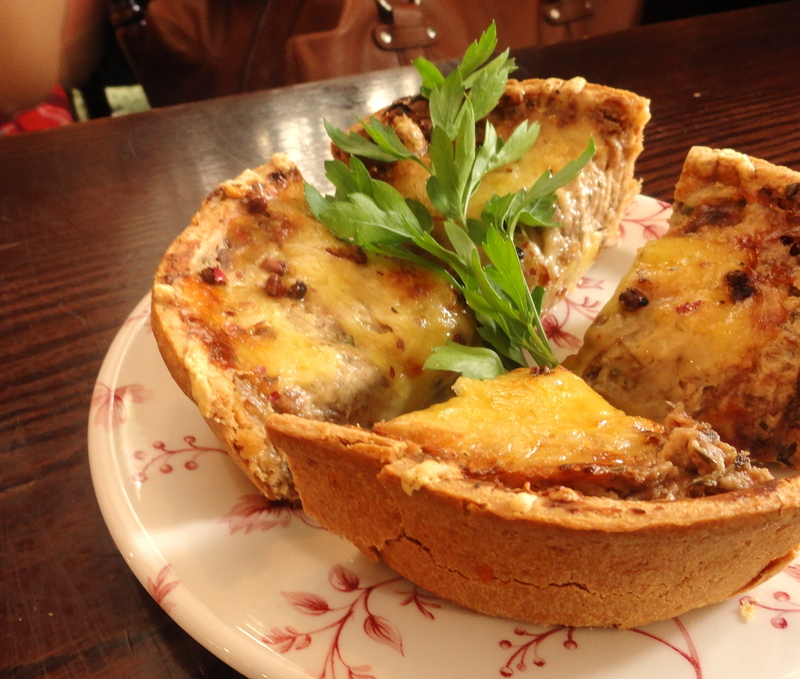 At £5.95 this is a filling, creamy option for a tender hungover stomach. 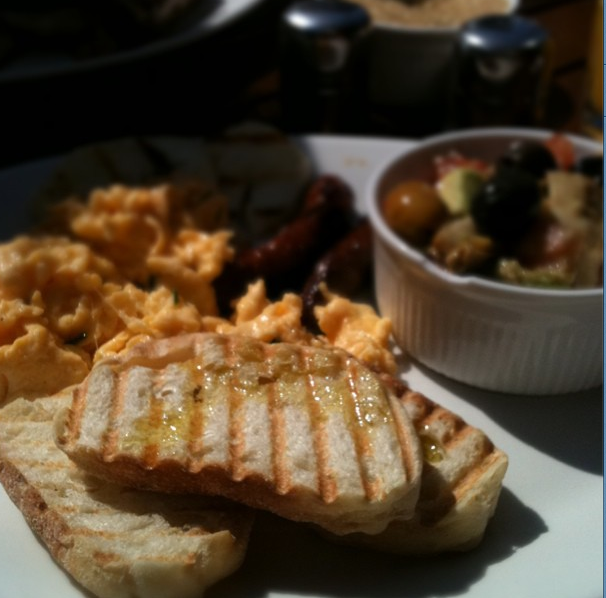 I had the classic mediterranean breakfast with amazing spicy lamb chipolatas (best chipolatas I’ve ever had), perfect buttery scrambled eggs, grilled halloumi, round pieces of grilled bread and a salad of grilled artichokes, olives, tomato and avocado. This was lovely and since I’m a massive artichoke love the £6.95 I had to trade for it didn’t feel very expensive. And those sausages! They were just sublime. I’m going to inquire about their sources next time I go. 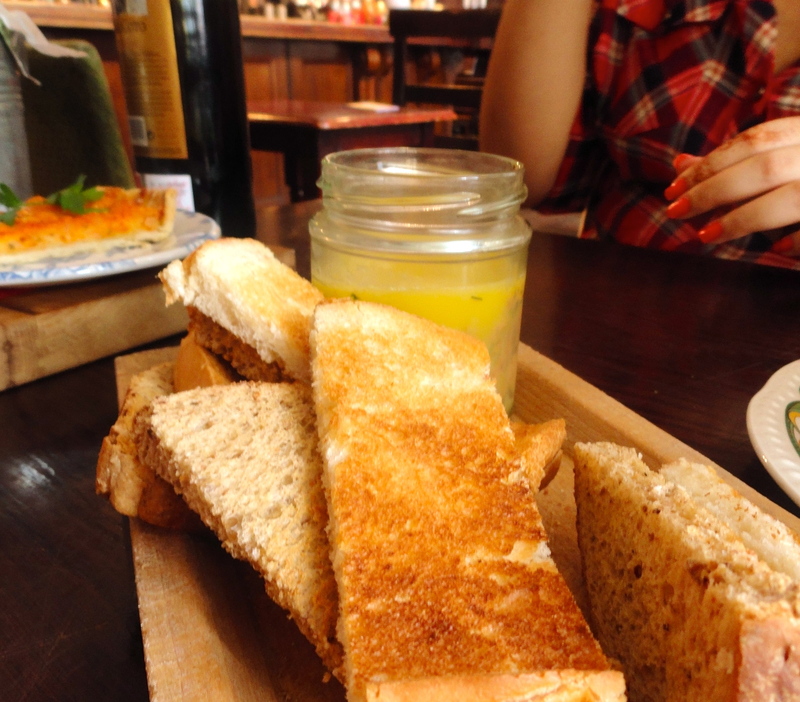 To this little feast we also had freshly squeezed orange juice and grapefruit juice which were just as refreshing as they should be. It took a while for our water to arrive but it was sunny and busy on the day of our visit, and the service was very nice overall. It’s got a lovely spot next to Newington Green to sit and watch people, but sadly you don’t have the view of weddings found outside Islington town hall that the Blue Legume does (surely weddings are the ultimate people watching?). Nevertheless, The Acoustic Café is awarded 8 meatballs out of 10. If you, like me, have been enjoying the insanely hot weather in London this weekend, you may have been wondering where you can grab a cheap lunch that you can bring out into the park with ease and enjoy in the sunshine. Yoshino sushi is such a place. 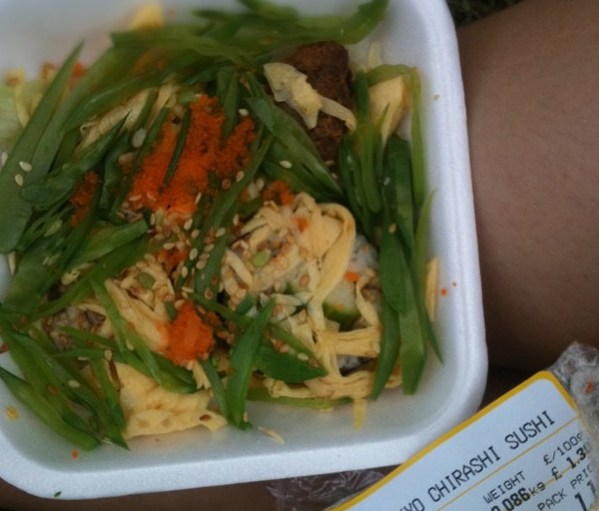 It’s perfect for the hot weather – just grab a bagfull of maki and nigiri and go sit in the park. 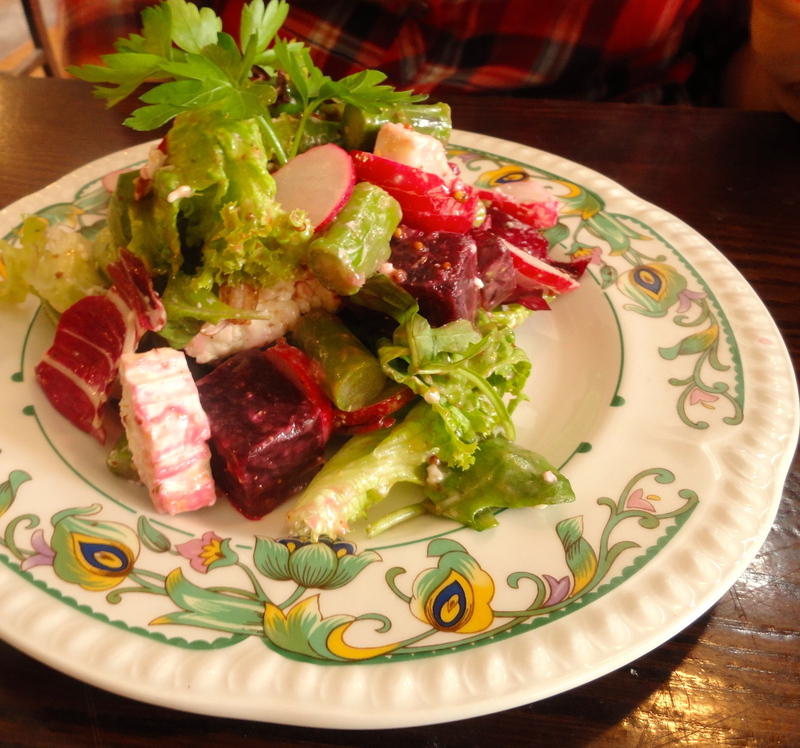 You order at the counter where different kinds of nigiri and makis are packed up in groups of 3, 4 or 8, and you also have special salads and sauces, such as Yoshino’s special carpaccio sauce. One plate of 4 maki is usually around £1.20-1.50 and three generous nigiris around £2.20-2.40. For best value get lots of maki, but make sure to get at least one pack of their perfect nigiris. The salmon here always tastes round and fresh, and never has that refrigerated chewy texture. It’s simply delicious. Since Yoshino sell lots of sushi their chefs (which you can see working behind the counter) continuously fill up the stocks with new rolls, and therefore the rice is always freshly made and soft rather than hard and tightly packed. The New York Roll with tempura is very tasty, as are their various california rolls. The eel and cucumber maki is strong in flavour and not for the weakly fish-hearted. Personally I’m not a fan of the spicy fried tuna or chicken katsu sushi, the former being too fishy and the latter being… chicken. But the plates are so cheap that you may want to try out for yourself. Yoshino used to be part of the Japan Centre, as part of promoting and introducing Japanese food and culture to the London audience. 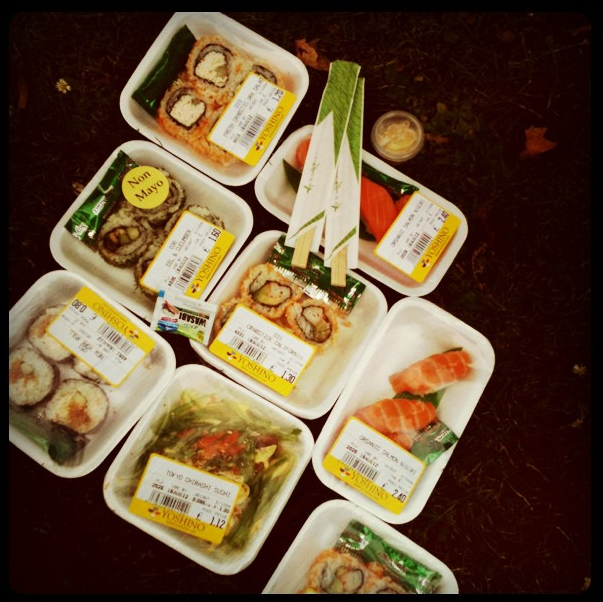 Maybe that’s why it still serves strangely cheap, authentic sushi in their small shop at Shaftesbury avenue. Admittedly the quality varies – sometimes it is spot-on, and sometimes just ok. But for the price I’m happy to go there any sunny day. 7 meatballs out of 10. Looking for a cheap and cheerful place for lunch close to my flat I searched my endless list of food blogs for a dim sum place I had a vague idea about close to Earl’s Court station. Thanks to the ever knowledgeable Mr Noodles I found Dragon Palace, a little gem of a place on Earl’s Court Road. As recommended by Mr Noodles we decided to go for dim sum with a side of Singaporean Needle Noodles. 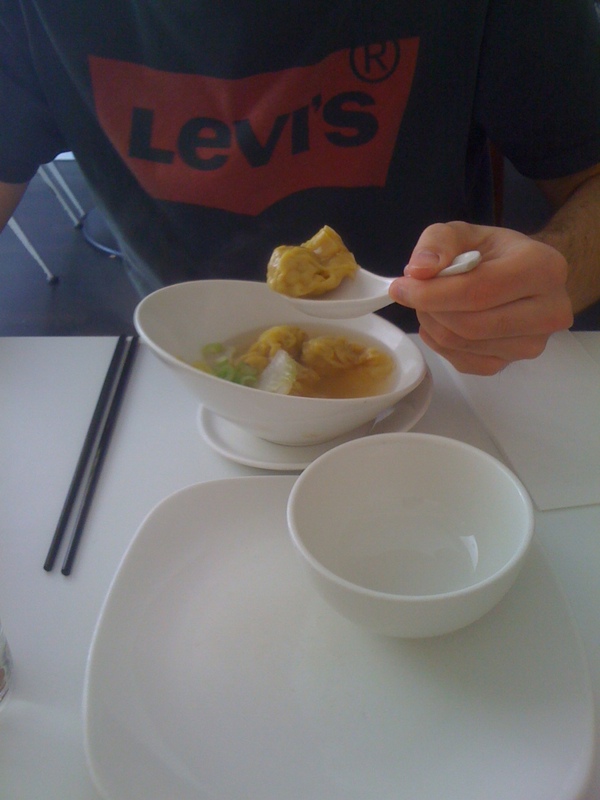 Mr Salted Cod also had a Won Ton soup to start the meal, which was perfectly light and tasty. We had Gar Herng Yee Mai Gor (Village Dumplings) which were beautiful parcels filled with red tilapia and vegetables, Ha Gau (prawn dumplings) filled with incredibly fresh prawns, Char Siu Cheung (BBQ Pork Cheung Fun) thick rolled noodles filled with lovely barbecued pork and War Tip (Shangai dumplings) which were pan fried and filled with pork and vegetables. 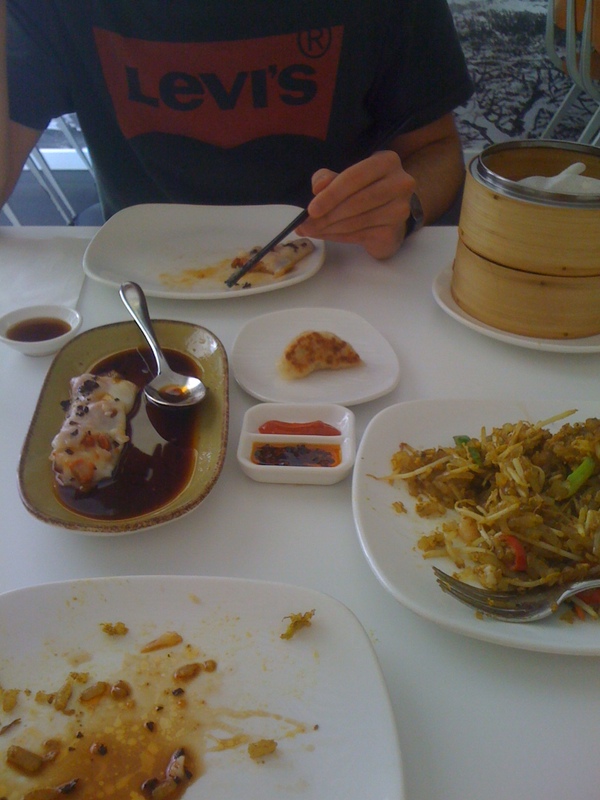 The dim sum was all really tasty and the parcels beautiful and thin as they should be. The accompanying noodles were definitely not necessary towards the end but were still amazing. Completely transparent and cut in small pieces, the noodles were smoky and salty and mixed with fresh vegetables and prawns in a slightly dry sauce. From left to right: Cheung Fun, Shangai dumplings, and Needle noodles. Service was also really good (always an important point for me) with the waiters being extremely attentive but not too invasive. The total came to £24 for two people with service included and way too much food. All in all this is a great choice for lunch in Earl’s Court and would be great for dinner with friends as there are a few big tables. Yesterday I ventured south of the river for a few drinks with my friend Nelson and stumbled across this little gem. We were originally set to go to Elephant & Castle but I failed to meet Nelson’s challenge of finding a nice after-work place to eat and drink there – is there not much in Elephant & Castle or does someone know of some diamonds in the rough? Recommendations are appreciated (especially by Nelson who lives there). Either way we went to Borough instead, and found the Roebuck. 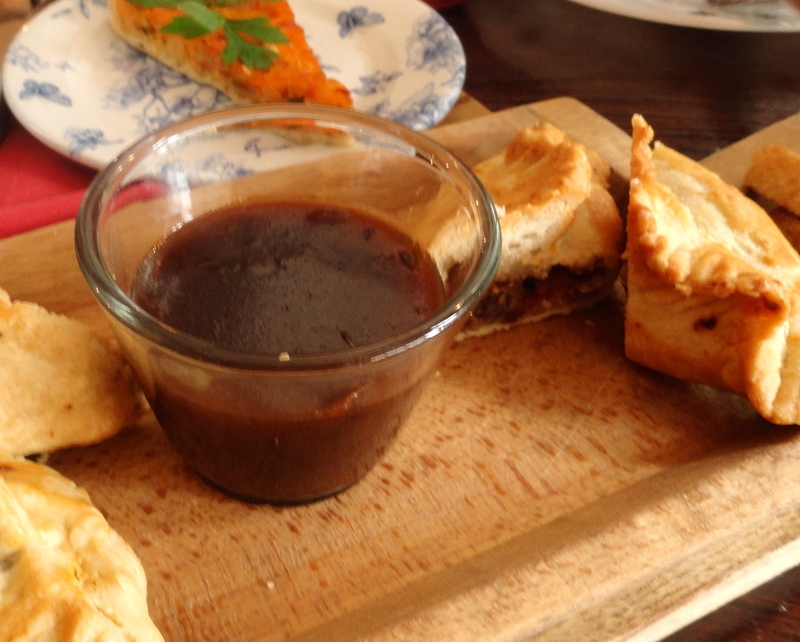 The Roebuck is a lovely little pub with airy rooms and a chilled out atmosphere. They have a very thoughtful selection of flowery British ales and wheat beers on tap, sourcing from local breweries such as Meantime in Greenwich and Sambrook’s in Battersea (on a related note, pardon the blurry photos…). Their food is excellent too. Nelson who is veggie had the Celeriac rösti burger with kidney bean salsa and sour cream. Having been a veggie all his life, he said the burger in itself was an 8.5, as the flavours were lovingly planned and it was freshly prepared from scratch. If anything it was a little too rich in the cheese, but given the fact that it was a veggie burger, I can’t seriously take the “too rich” as a problem. The portion of chips was in the smallest category, sadly, as this would otherwise had been quite a bargain at £7.75. I had an absolutely delicious pan fried coley (a regional white fish which happens to be a sustainable alternative to the over-fished cod) with cauliflower puree and courgette batons with garlic butter sauce (pictured at the top). The skin was crisp and packed full of flavour, and melted incredibly well with the tender fish and subtle cauliflower puree. The garlic butter sauce felt lush and a bit lavish, and was lovely. I often complain over England not being fish-loving enough (in comparison to my fish and seafood-obsessed Swedes), but this little revelation will certainly make me try fish in gastropubs more often. 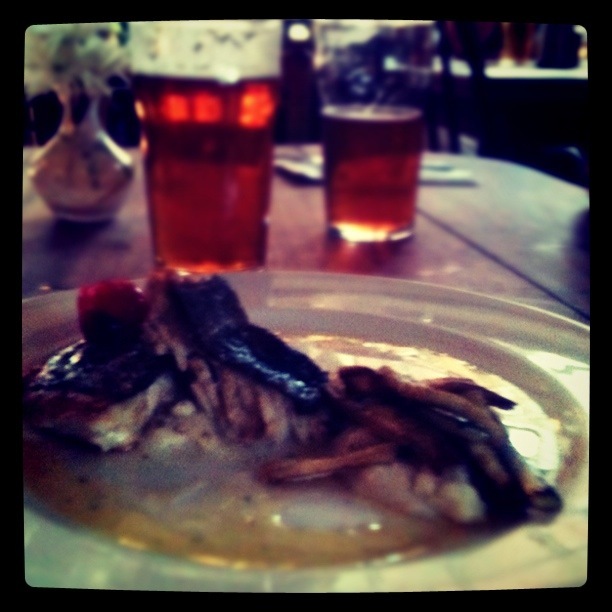 The coley at the Roebuck holds gastropub standards, and at £11.50 I thought that was rather cheap – but then again, the portion was quite small, so it’s more of a tasty treat than a filling main for a starving person. All in all, the Roebuck is a very nice little pub. A real effort has clearly been put into creating interesting, locally sourced and freshly prepared food, and the ale selection is very satisfying. 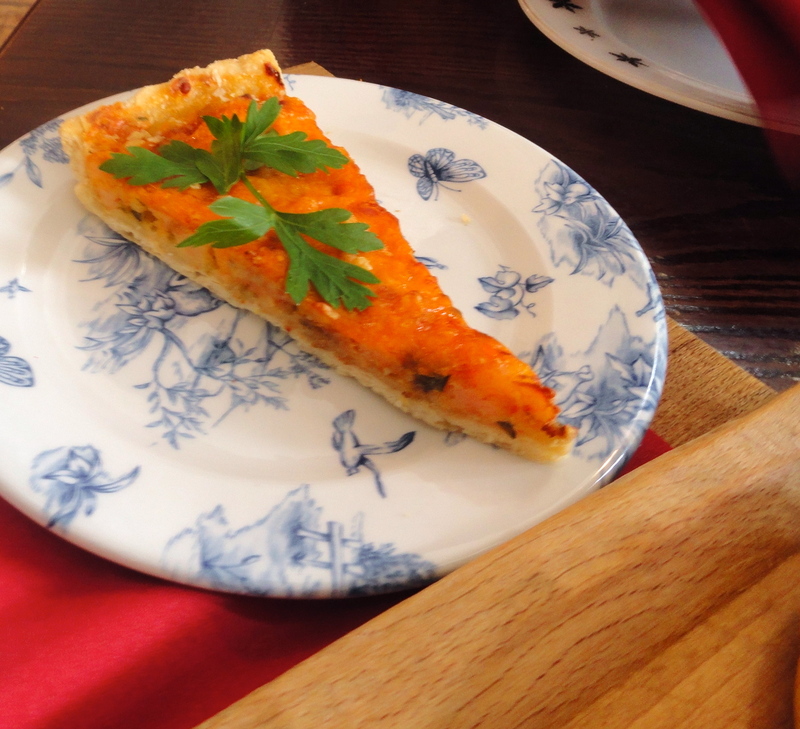 Go for a mid-week treat when you want to chill and have some good food, as the atmosphere seems a bit south of the river too – not too stressful, never packed, but very friendly and relaxed. If the portions had been of slightly bigger size me and Nelson would have given it 8 meatballs out of 10, but we settled for 7.5/10.